Travel back in time to Caesar’s grand court where you will take on the role of the royal cook. Click here to play! 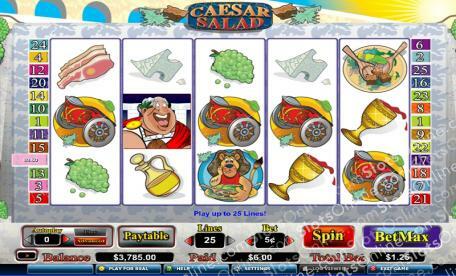 Spin the reels to serve up Caesar’s favorite foods and you will be handsomely rewarded for your efforts. As the royal cook, you’ll be meeting the demands of Caesar himself. Spin this mighty ruler across the reels as much as possible as he not only acts as a substitute, but he will also pay out up to 7500 times your line bet if you can get two or more on an active payline. Watch out for the guards, as these guys will step in at a moment’s notice. Spin two to five of these across an active payline and you’ll bring in up to 2000 times your line bet. Also keep an eye out for lions, chariots, and empty salad bowls to help you bring in the cash. As a cook you’ll need your ingredients. Spin wine, olive oil, grapes, bacon, Parmesan, and croutons to help you in your quest for cash. Caesar’s wife will make a few appearances at the table. This lovely lady is a scatter symbol and she will not only multiply your total bet, but she will also award you with a number of free spins if you can spin her three or more times anywhere on the board. Do you have what it takes to feed the mighty Caesar? Find out in this amazing game! Caesar's beautiful wife acts as a scatter. Spin two or more anywhere on the board to multiply your total bet by 1, 5, 10, or 100 respectively. If you can spin three or more of here anywhere you will get 10 free spins in which prizes are tripled. Caesar himself is a wild symbol. He will replace all other symbols, excluding scatters, to bring in more winning combinations. He will also pay out up to 7500 times your line bet if you spin two or more across an active payline.